After I got the kids off to school today, I spent pretty much all morning balancing my checkbook. I guess that's what happens when you go a month without writing anything down! While I did that, and paid a bunch of bills, I watched last night's episode of Parenthood. I absolutely love that show, and I'm so sad that it's on the final season! I was SO cold this morning that it was hard to get motivated to go out for a run. When I woke up and checked the temp, I was shocked to see that it was 24 degrees outside. I was really tempted to just skip the run and take a hot shower instead, but I knew I'd feel better if I just did it. I decided to go run at the track again. I feel like I've run more miles on the track in the past three weeks than I have in the past three years combined, but I kind of like running there. It's quiet, there's no traffic, and it feels nice and soft to run on. Normally, I do long runs on Fridays; but I decided to run the Monroe Half this Sunday, so I shifted the schedule a bit, and just had 3.5 miles to do today. My planned easy pace was 9:53-10:47/mile. After a half mile, I was surprised to see my pace was in the low 9:00's, because it felt pretty easy. I don't know if that means the speed work + cross training is actually working, or maybe I was just having a good day, but I'm happy with that! I consciously tried to slow down a bit, because I want to save my energy for Sunday. I ended up doing 3.5 miles in 32:32, a 9:18/mile pace. (I forgot to press the stop button on my Garmin, until a few minutes after I finished). My plan for Sunday is to just run at a pretty easy pace. I think I'll feel good for about 8-10 miles, and then it'll get tough, so I want to plan on saving some energy. My longest run since August was 10 miles, and that was a month ago. I run enough that I can pretty much just go run a half-marathon on a whim, but that's not to say it'll be easy. I expect to be sore afterward! But I really like this particular race, and if I take it nice and easy, I should be able to enjoy it. There is also a chance that my brother Nathan will run it with me--I hope so. I'm planning to run about a 10:15-10:30 pace, but if I happen to feel really good that day, I may aim for sub-10:00. For dinner tonight, I made what ended up being one of the best pizzas I've ever tasted--and it was cheese-less! We always used to do "Pizza Fridays" and make homemade pizza, but we haven't done that in a long time, so I wanted to do it today. I made my favorite whole wheat crust recipe, and divided the dough into fourths so that we could each make our own individual pizza. After getting home from the grocery store, I realized we didn't have any pizza sauce; so I just took a can of tomato paste and added a touch of sugar, some Italian seasonings, and enough water to thin it out. I decided to make an all-veggie pizza with no cheese. I chopped up garlic (lots of garlic! ), peppers, onions, zucchini, and mushrooms, and sautéed them in olive oil. Then to assemble my pizza, I spread the tomato paste mixture on the pre-baked crust, sprinkled on some red pepper flakes, and topped it with the veggie mixture. I sprinkled some black olives on it, too, and then baked it at 450 for about 10 minutes. I wasn't sure how it would taste, especially with that tomato paste-sauce, but it was AMAZING. I'm already looking forward to making the same thing next Friday! I didn't miss the cheese at all, and the entire pizza was only 9 PointsPlus (crust was 6, sauce was 1, olives were 1, and the oil from the veggies was 1). One of these days, I may try doing a vegan challenge just for a month, to make myself get more creative with food (vegetables in particular). I'm not planning to become vegan, but I do think that it would be a good challenge to try. Speaking of challenges, I forgot to pick a challenge for November. Maybe I'll consider the cross training (bike riding) once per week my challenge for the month. Hey I sent you an email last week (hoping it didn't get caught in the spam filter) about a fitness challenge I am going to host on my blog starting in January. Hope you get a chance to read it. For my part of it I plan on doing a Whole30 in Jan. An entire month of Eat Clean and then a month of vegan. Taking breaks in between of course. I'll have to remember that awesome pizza when I take on the vegan challenge. Great post! My sister orders her pizzas all the time with no cheese (for dietary restriction reasons), and I'm always thinking how sad it is. You know, I have to readjust my attitude! She may have it completely right... I'm inspired - I'll try it. Thanks Katie! Good luck with the race today! Hope you enjoyed it. I did a half this weekend too - it was a great weekend for a race! 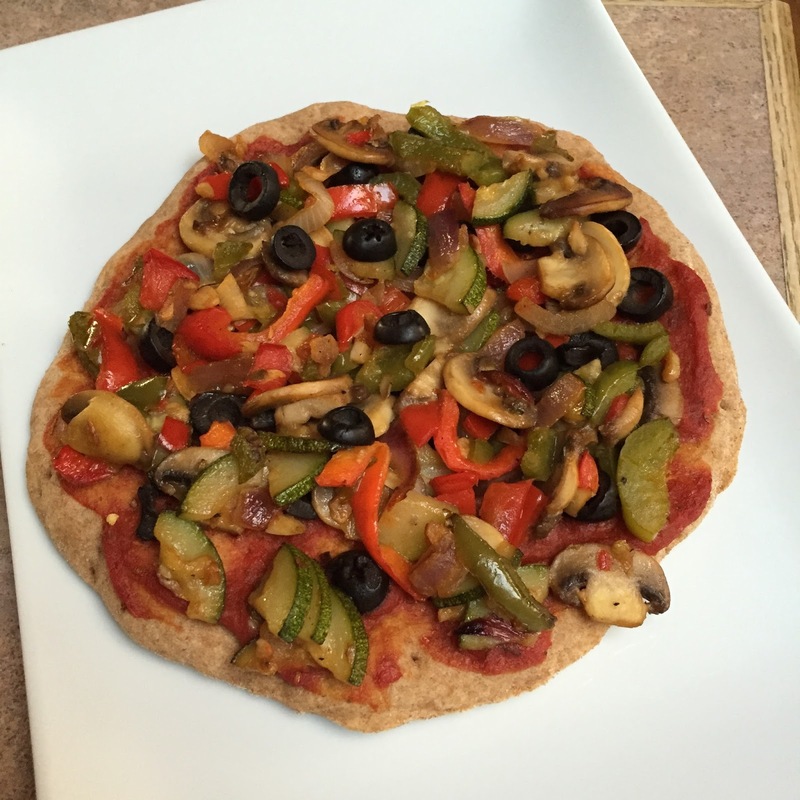 I love vegan pizza! Let me know if you want recipes for your challenge! !